The aim of this program is to train you as a professional coach. Participants will learn and practice professional coaching skills. Therefore, the course is highly experiential. You will earn the required 60hrs to apply for the first level accreditation (ACC) with the International Coaching Federation (ICF). You will be able to work with executives, managers or anyone willing to be coached. The client is the expert of their life while the coach is an expert of the process. The process aims to inspire client-generated solutions and strategies. Therefore, coaching is distinct from counseling, mentoring and consulting. Coaching skills are becoming increasingly relevant to support others as global complexity and uncertainty increase. Some key benefits of using a coach include improved performance, productivity, outlook and balance. At CIMBA Italy, we aim to support our students and clients in becoming their best. And coaching is the key component in that, in all of our leadership development programs. We will empower you to expand the potential of others. We encourage you to check out the ICF website to learn more about coaching and individual accreditation. The course will be conducted in English and the instructors are proficient in Italian as well. In addition, to ICF competency-specific learning and practice, students will study and apply insights, tools and techniques from neuroscience including brain basics, mindfulness, reappraisal, and habits. Coach’s Mindset: Participant has personal commitment to a growth mindset and self-inquiry. They have experience leveraging their own challenges and contemplating subsequent learning. A personal willingness and desire to reflect, introspect and grow. An open attitude to receiving feedback for improvement and experience with how personal intentional change works. Ready and open to be coached in and outside of class and to be given feedback about their progress as a coach. Katiuscia Baggio, MBA, PCC – Katiuscia, a native Italian, has been coaching managers, entrepreneurs and international business students for over 10 years. She is also the director of CIMBA Italy’s Executive Education programs. In addition, Katiuscia is a leadership trainer for various programs including CIMBA’s LIFE Training. Questions? Ready to register? Email executive@cimba.it to set up an appointment to speak with one of the trainers directly. Our training takes the 11 ICF Core Competencies and translates them into a manageable framework where the ICF competency of “Coaching Presence” serves at the foundation. 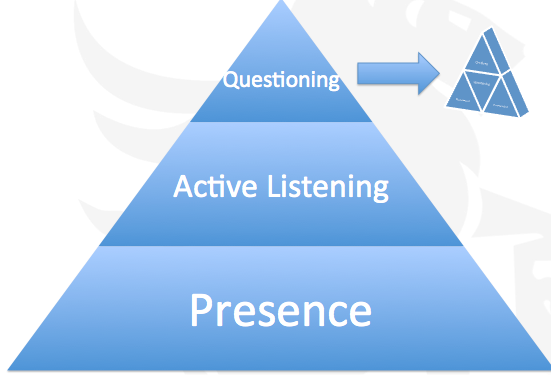 Building from Coaching Presence (ICF 4), is Active Listening (ICF 5) and then Powerful Questioning (ICF 6). The key is Questioning, not simply asking questions. Questioning denotes a process. 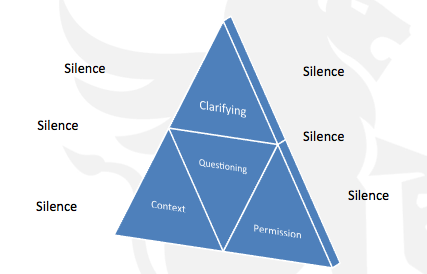 This process includes powerful questions, clarifying, placement, permission, and spaciousness through silence. 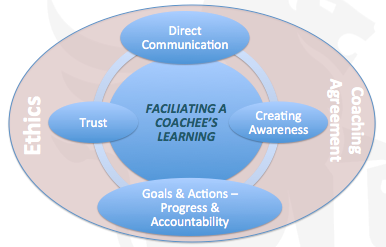 Finally, what is present through each coach conversation is a commitment to the Coaching Agreement (ICF 2) and Coaching Ethics (ICF 1).